Guns.com reports that Illinois governor Quinn wants to ban AR-15s and high cap mags. He is of course using the shooting in Colorado to push his ideology and will no doubt use the recent shooting in Wisconsin as well. As reported by the Associated Press, the proposal would specifically ban the AK-47, AR-15 and TEC-9. And in a way, it would be confiscatory. In other words, if one couldn’t prove they had purchased the firearm prior to the ban, then he/she would face punitive consequences. Solar Tactical has developed the MEFR for easier reloads for people who run AKs. Some caveats include the need to modify the rifle and it doesn’t work with all variants. The AK-47 Strikeforce Elite Package is constructed with Military Type III Anodized, 6061 T6 aluminum and has one-four inch Picatinny rail, two-two inch Picatinny rails, one-two inch Picatinny rail with swivel stud, a six position commercial buffer tube and an aluminum receiver mount. Each AK-47 Strikeforce Elite Ultimate Professional Stock Package features an ergonomic texture with ventilated upper and lower handguards, blank inserts for when rails are not in use, a 3M® industrial grade self-adhesive soft touch cheekrest pad, removable/adjustable cheekrest (3/8”), slot for tactical sling attachment, three sling swivel studs and DuPont® extreme temperature glass reinforced polymer. This item replaces the original gas tube with a new one that contains a new charging handle and slide. 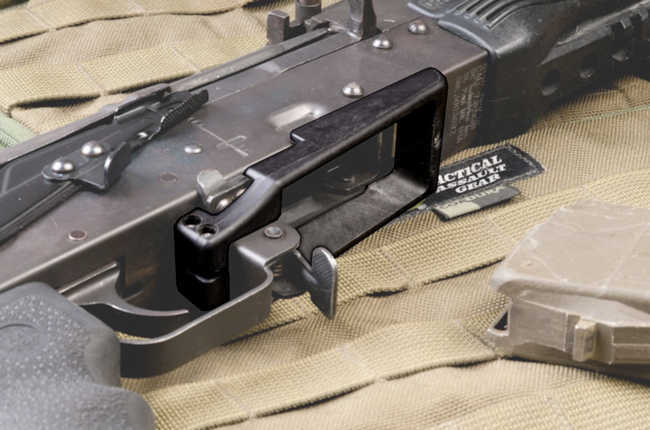 The new charging handle protrudes from the left side directly over the forearm of the rifle at the perfect angle to allow for easier and less troublesome charging. With a slight force in the upward direction from the operator the bolt assembly can be locked out of battery and away from the chamber. • Quicker cooling on gas system. Things to look for, identifying shoddy workmanship, etc.